Ponderosa Pines: Rugged Trees With A Sweet Smell Sink your nose into the yellow bark of a Ponderosa and take a big whiff: It may smell more like a dessert topping than a desert pine. As a group of hikers in Arizona recently learned, there are plenty of reasons to help this iconic Western tree thrive. If you're driving through the high desert of the Southwest — or sitting at home, watching an old episode of Bonanza — you can't miss the Ponderosa pine. It's the signature tree of the mountain West. President Obama and his family surely saw plenty of Ponderosas during Sunday's visit to the Grand Canyon. If they had driven about an hour south, they could have seen the largest unbroken swath of the trees in the world. It extends 300 miles — from northern Arizona to southwestern New Mexico. 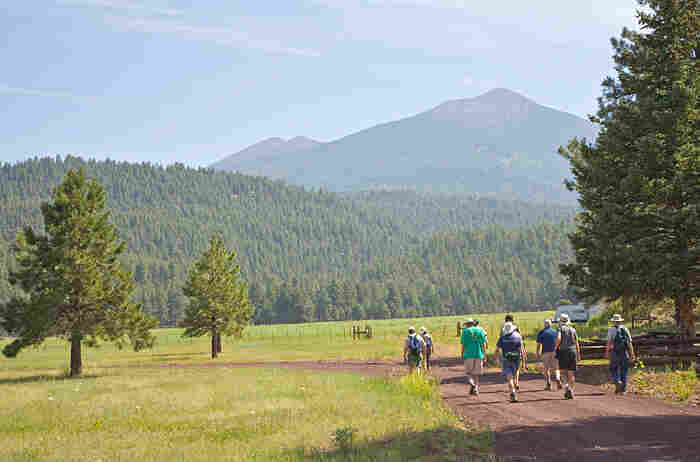 In Arizona's Coconino National Forest, tourists take hiking tours through the trees. You don't have to look hard for them — they're everywhere. As prolific as Ponderosas are, there's still a lot that scientists don't know about them. For example, they change color as they get older. And they begin to smell a bit strange, too. "Early lumbermen who came out here thought they were two different species," says Steve Hirst of the U.S. Forest Service, who leads tours through the area. The trees with black bark were called black jack pine; those with yellow bark were called yellow pine. But they're the same tree — the yellow ones are just older. When the tree reaches 110 to 120 years old (a mere teenager for a Ponderosa pine), it begins to shed its black bark and reveal an inner bark of yellow. That's why locals call them "Yellowbellies." Scientists still don't know why this happens. But just look at a stump of an old Ponderosa and you'll see a massive swath of yellow. There's something else that begins to happen to the tree in the yellowbelly phase. 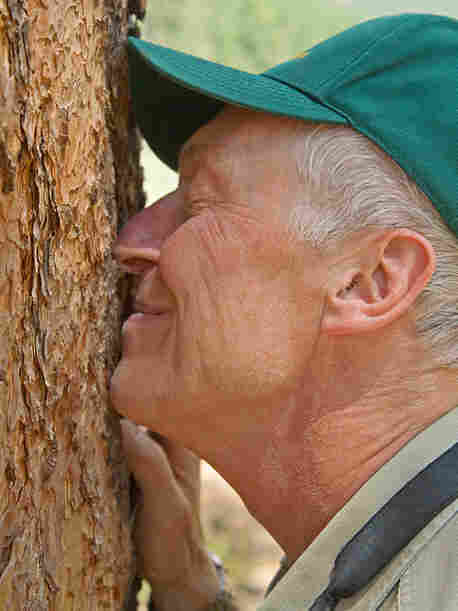 Stick your nose into a crevice of the bark and take a big sniff. It may smell like butterscotch or vanilla. The next person who smells it may insist it's more like cinnamon, or even coconut. When you stick your nose deep into a Ponderosa, you're also getting intimate with the tree's armor against fires: bark that is thick, flaky and sometimes compared to pieces of a jigsaw puzzle. The tree needs that protective layer. The hot, dry Southwest gets hit by a lot of forest fires, most of them touched off by lightning. This part of northern Arizona has one of the highest incidences of lightning strikes in the country. But, Hirst says, lightning isn't enough to finish off a Ponderosa. When lightning hits one, "it flash-boils the sap, and it just blows the bark off. It doesn't burn the tree," he says. When the pieces of bark fly off, they carry away the fire's heat. So a major fire can leave "the Ponderosas in charge" of a forest, Hirst says. They remain standing while the competition burns. At least that's what's supposed to happen under natural conditions. But for almost a century, conditions in this area weren't natural. 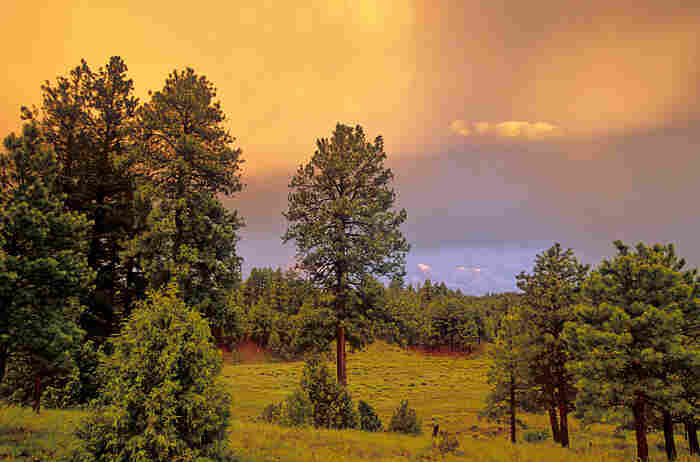 Forest fires were contained to preserve the Ponderosas, so they could be cut down for valuable lumber. With San Francisco Mountain as their background, hikers move alongside a strand of Ponderosa pines. Left unchecked, the forest undergrowth became dense fuel — feeding fires that could easily grow out of control. And an intense fire can "ladder up" to the crowns of the Ponderosas, Hirst says. "When the crowns burn, and you destroy an entire stand, they may never come back." That's why the U.S. Forest Service, working with environmental groups and timber companies, is thinning out trees and setting prescribed fires, so the Ponderosas can continue to reign over this stretch of the Southwest. At the end of a recent day-long hike, Hirst gathers his tour in a spot that he calls the grandest in all the forest, an open clearing amid hundred-foot high pines. The trees are dwarfed by the purple crags of the San Francisco Mountain, which at 12,633 feet includes the highest peak in Arizona. But there's not much time to enjoy the view. The forest gives a gentle nudge: Thunder. Then there's an even bigger nudge, as the thunder gets a bit louder. And these visitors don't need to be told that their hike is over. The images for this story come to NPR from photographer Tom Bean.